If you have read my blog before you will know that I love going to baking classes run by Sarah Brigden from babyCakes. Classes I have previously gone to include cupcakes, decorative chocolate, desserts and high tea. This year, Sarah is only running classes through Tuart College, with the classes being held at the Mirrabooka Hospitality Training Centre. Her second series of 6 week classes (one night a week) this year is on pastry making, something I really wanted to learn more of, and after enrolling in the class last year (and convincing my friend Kelly to come along with me), I was really looking forward to going to the first class. The Mirrabooka Hospitality Training Centre is located at Mirrabooka High School and was only recently constructed to provide students with the opportunity to complete certificates in hospitality while still at high school. The centre includes a café/restaurant, barrista/bar area, seminar/function space, commercial kitchen and ancillary support and storage facilities. It is the commercial kitchen where the after hours short courses take place, with 16 individual work stations, commercial equipment and a demonstration area at the front. It is a great place to be learning and cooking. 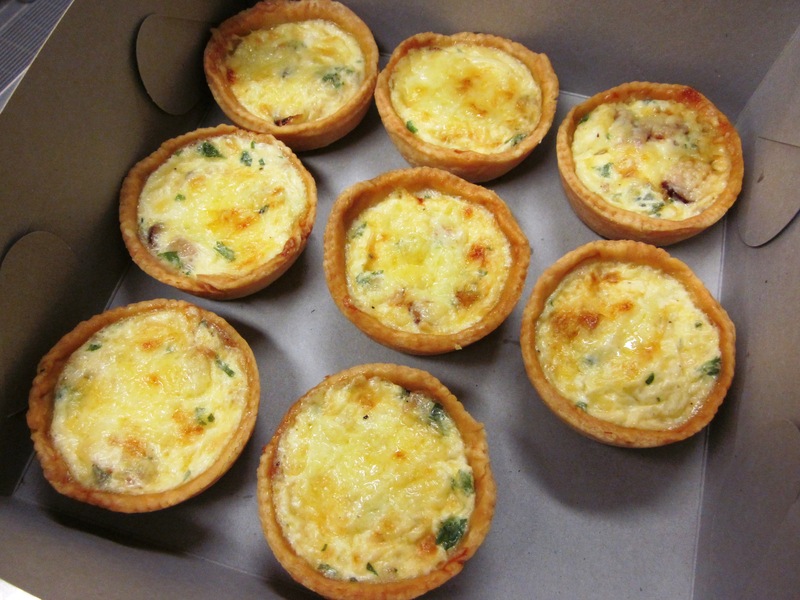 Our first class was on savoury pastry, making a quiche. 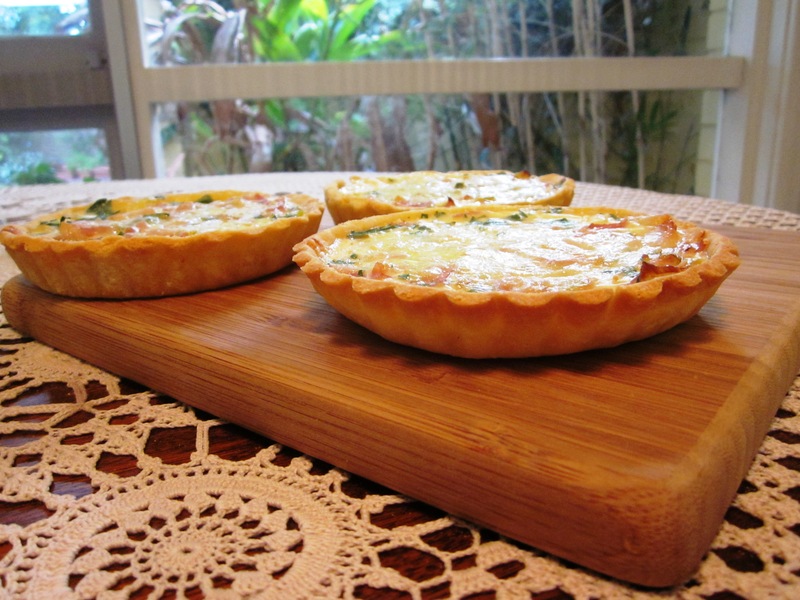 I have made quiches before, both with and without pastry (you add a pastry mix to the quiche mix instead). I have used both shop bought pastry and made my own pasty in the past. I have to say that the pastry we made with Sarah was the best I have ever made for a quiche. The pastry had a lovely savoury flavour and crisp, crumbly texture. It was also quite easy to work with. As always, a big thank you to Sarah for allowing me to share her recipes on my blog. I made the quiche again at home and the pastry worked just as well as in the class. The great thing about quiche is you can use whatever filling you want. It is a great way to use up ingredients from the fridge (ham, roasted veggies, small amounts of cheeses – the list is endless). I have included the recipe for a bacon and leek quiche here, however I also made some with mini roma tomatoes, asparagus and goats cheese. Preheat your oven to 160C fan forced (180C). 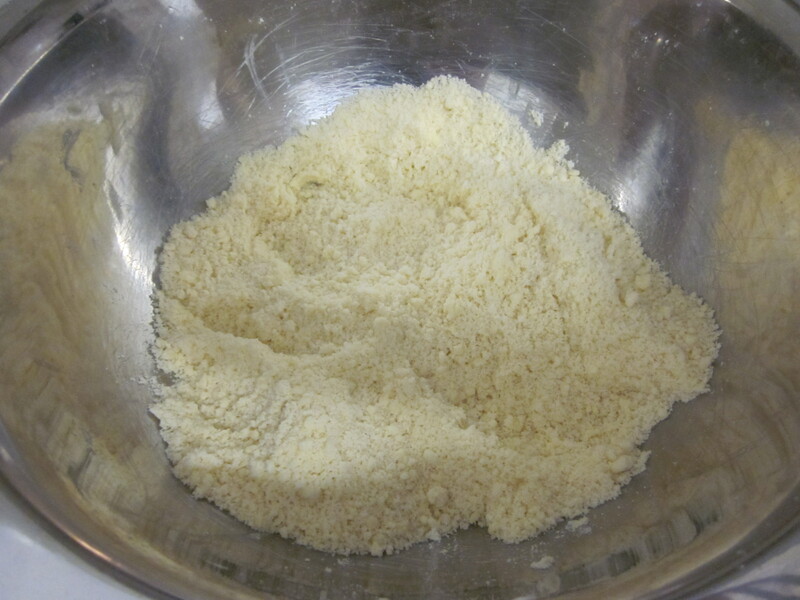 To make the pastry, rub the butter into the flour in a bowl until it looks like coarse breadcrumbs (note – you can also do this in a food processor, but it is actually quite enjoyable to do it by hand). Add the egg and mix with your hands to form a dough. If it seems a bit dry and is not coming together, add a very small amount of water. I have never needed to do this however. Remove the dough from the bowl and onto a clean, lightly floured work surface. Lightly flour the top of the dough and knead just until it comes together and forms a smooth ball. Wrap the dough in cling film and rest in the fridge for at least 15 minutes (I usually rest mine for 30 minutes). While the dough is resting, start preparing your filling. For the leek and bacon filling, add the bacon to a frying pan and fry until it starts to crisp and then add the leek. Cook until the leek is soft and starting to lightly caramelise. Only add oil to the pan if you bacon is very lean, as the fat from the bacon will render off and provide enough oil to cook the leeks in. Remove from the heat and stir through the parsley. Set aside and allow to cool slightly until needed. Spray the tins with baking spray and working on a clean, lightly floured surface, roll out the pastry until it is at least 0.5cm thin (mine was about 3-4mm). Make it thinner or thicker depending on how you prefer your pastry. Thicker pastry will take longer to cook. Cut out a round 1-2 cm larger than the tin you will be lining. I used a saucer that was slightly larger than my tins as a guide. 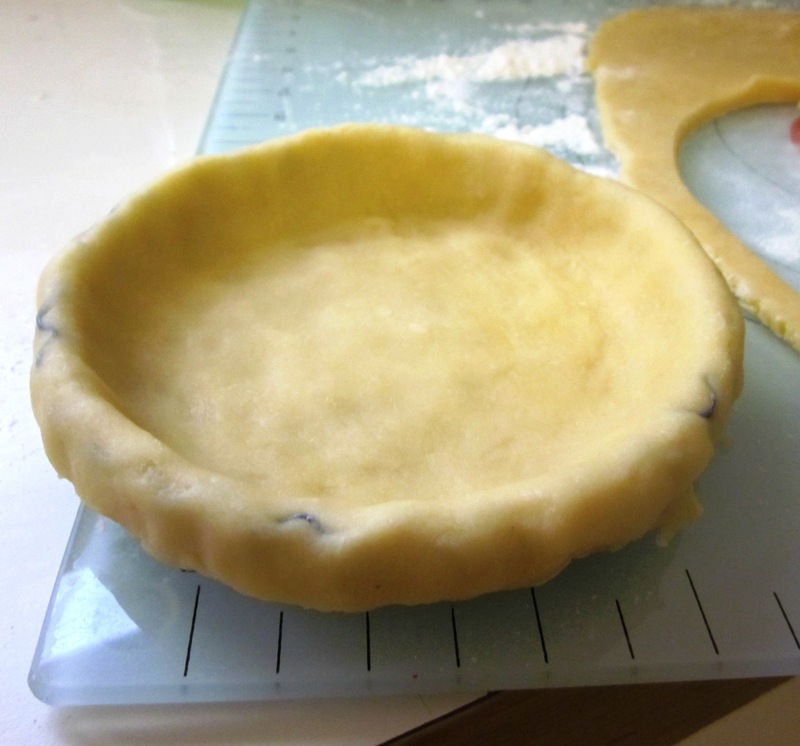 Place the pastry on top of the tin and using your fingers, gently push it into the corners and base. Keep a rim of pastry around the outside of the tin (see picture below) as this will help keep the pastry from shrinking (you cut it off after the quiches are cooked). Once all the tins are lined, return the pastry to the fridge for at least 10 minutes. Keep any extra pastry in the fridge, in case you get any crack that you need to repair later. Once the pastry has rested for 10 minutes, it needs to be blind baked. 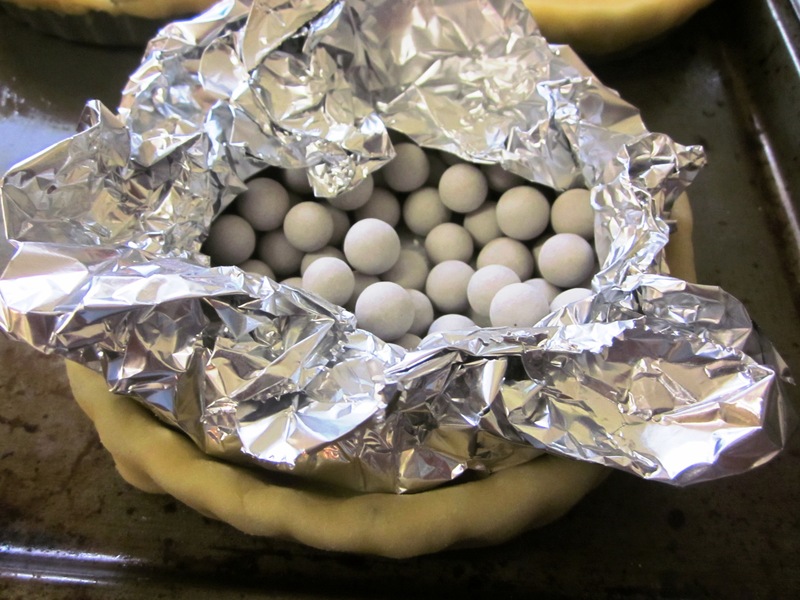 Place a piece of aluminium foil (slightly hanging over the edges) in each pastry case, and then add baking beans (or uncooked rice or dried lentils/beans). Bake in the oven for around 15 – 20 minutes (cooking time will depend on how thick your pastry is and how small/large the tin is). The pastry should be starting to go golden around the edges and have only a slight bit of moisture on the bottom when the foil is removed. I always place my tins on a baking tray as this makes it easier to get in and out of the oven, and if you do have any leaks or spills, is easier to clean than the oven. While the pastry is baking, whisk together the eggs and milk with salt and pepper to taste. After blind baking, remove the foil and beans and brush a small amount of beaten egg wash over the inside of each pastry case. This creates a seal and prevents the quiche mix from leaking into the pastry. If you have any cracks, seal these with a little extra pastry. 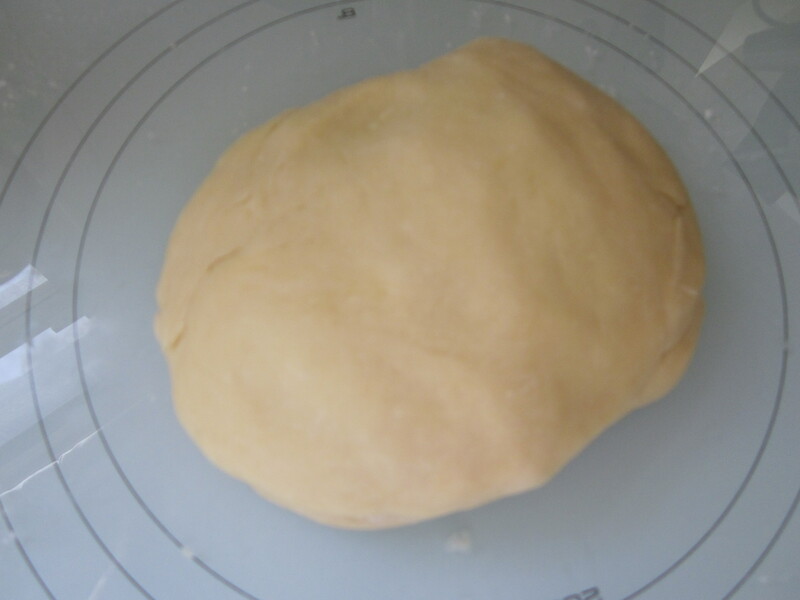 Return the pastry to the oven for a further 5 minutes. Remove the pastry cases from the oven and add some of the bacon and leek filling (or filling of your choice) to the base of each case. If you are making a large quiche, add some of the cheese at this stage too. Pour in the wet mixture, being careful not to over fill the cases, and then top with the grated cheese. Return (gently) to the oven and bake for approximately 15 minutes, until the quiche has set and is golden brown. 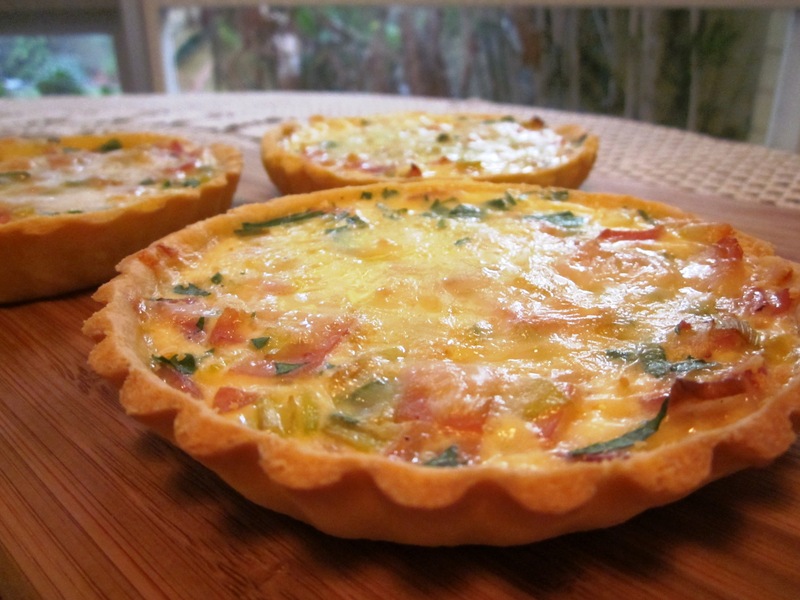 Again, if you are making a larger quiche it will take longer, small and it will bake quicker. Remove from the oven and allow to cool slightly before removing from the tins. Serve either warm or cold.